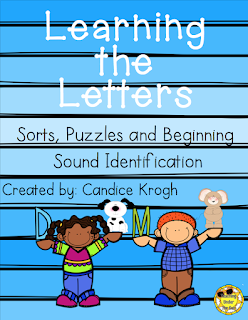 Please welcome Candice from Teaching Under the Sun today, as she guest blogs about Interventions for Learning the Alphabet! Kindergarten can be so rewarding. Most kids come in ready to learn to read. They know the alphabet including the letter names and sounds. Most just need a quick review to reinforce what they learned in Pre-K or at home. But what about the ones who didn’t go to Pre-K? The ones whose parents do not speak English and couldn’t teach them the alphabet? The ones who need a little more time to develop the skills necessary for reading? Do they get left behind in the classroom? Of course not! As a Kindergarten teacher it is my job to teach all my students to read. Some of these kids just need a little more time and exposure. The biggest challenge is keeping the child who needs more exposure engaged. If the class is working on Word Families, this other child is most likely bored. I need to provide letter name and sound experiences. Here are some ways I do that. I am lucky enough to have a classroom full of technology. I have 1:1 computers, 15 laptops and 6 desktops. I also have an iPad, 5 old iPhones, and 1 iPod touch. All of which still run some great educational apps. I use these for differentiating as needed. 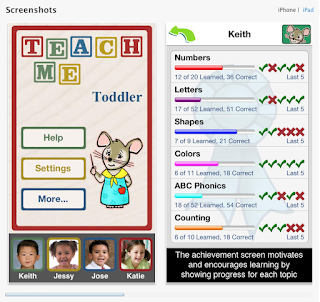 Teach Me Toddler is a great little app. At $0.99 is is a bargain as well. It allows you to assign students, you can put their picture in so they pick the right name. The app teacher Numbers, Shapes, Colors, Letter Names and Sounds, and Counting. In the settings, you can track progress, turn skills on and off, and change how many correct responses are needed for mastery. I have used this app for several years and the kids enjoy it. They earn ‘stickers’ as they master an item, I usually bump it up to 5 correct so they don’t spend all their time playing with the stickers. The ability to see their progress is helpful. I can see which letters they have learned and provide more help with specific letters. I also use music to teach and practice letters and sounds. Have Fun Teaching has a song for each letter of the alphabet. You can find them all here on YouTube. This is the whole alphabet. Our students cannot access YouTube under their computer logins, so I purchased the video and song sets last year from Have Fun Teaching. Again, I can use any of my devices to play the songs or show the videos to the kids who need extra help. We have an intervention block built into our day for remediation and enrichment. I use this time to work with these kids as well. I use alphabet puzzle, letter magnets, and mats for letter matching. I do font sorts to differentiate between letters. I also use printables for practice. 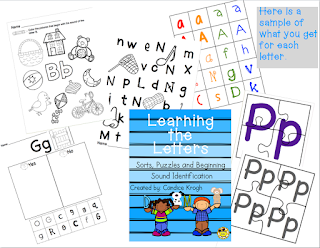 This set includes letter identification, font sorting, beginning sound identification, and letter puzzles for each letter. I can easily pick and choose the letter and activity the child needs more work on. Remember, everyone learns. It just some kids a little longer and more practice. Having a variety of activities and resources allows me to find the one that will work for each child. Check out my blog; Teaching Under the Sun.